This time of year we focus on family, friends, and food for our holiday celebrations. I know I’ve been thinking about all of those things lately (especially pie!). To get my mornings off on the right foot, and to help keep my pie cravings in check, I’ve been blending up these Green Grape, Apple, and Cinnamon Smoothies. They’re easy to make, healthy, and you’ll find some flavors of the season mixed in. This is my favorite time of year, for sure. The sweaters, boots, colorful leaves, and plans to gather with friends and family are all comforting to me. And of course the food that goes with the season is fabulous, which can lead me to easily overindulge! For something healthy and delicious, I’ve been starting my days with Green Grape, Apple, and Cinnamon Smoothies. They’re a delight and make a great afternoon snack, too. 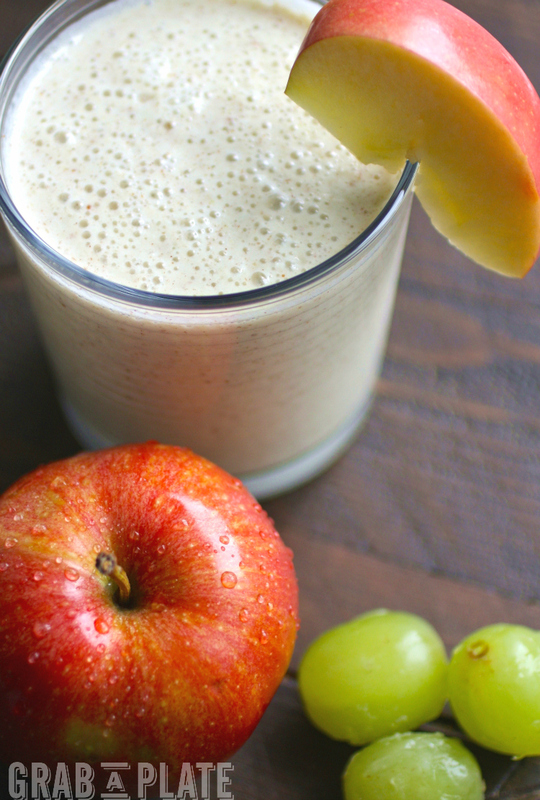 These smoothies are easy to make and taste like the season! I’ve had a lot of apples around lately and I want to put them to good use. They’re good for you (an apple a day, and all) and you’ll easily find them in stores and markets this time of year. For some seasonal dessert ideas that include apples galore, check out my recipe for Skillet Apple Pie with Salted Caramel Whipped Topping. Another goodie: Apple and Sweet Potato Pastry Braids. They’re both perfect for holiday treats, but I can’t forget Cranberry-Apple Pie Spring Rolls — so fun! The green grapes are a double-duty ingredient in these smoothies. I add them to a resealable bag and pop them in the freezer for a bit. After an hour or so, they turn into flavorful ice cubes for these smoothies. 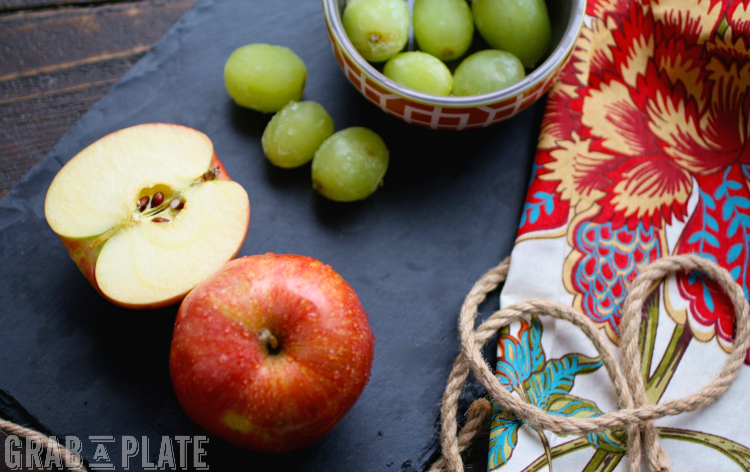 Green grapes are good for you, too, and make it easy to add more fruit to your morning! I toss ground flax seeds into the blender for these smoothies, and have also popped in fresh spinach leaves, too, for a nice green hue and hit of added veggies. The cinnamon and honey bring the ingredients together for a seasonal flavor. 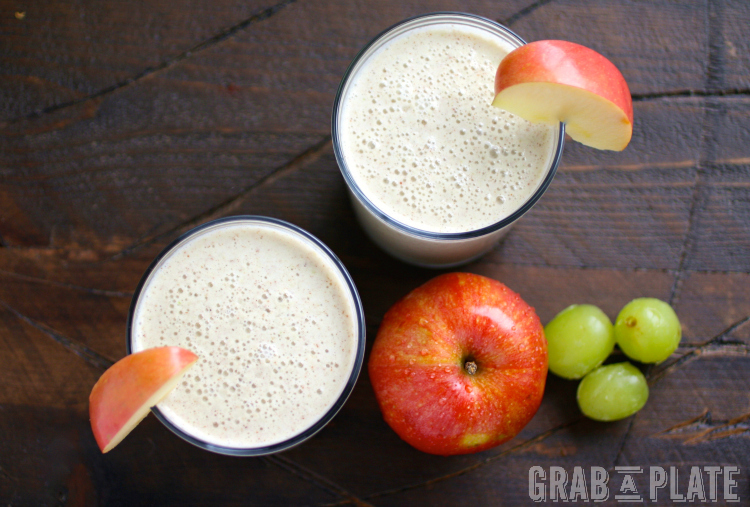 Green Grape, Apple, and Cinnamon Smoothies are a great way to get your day off to a good start. You’ll love how easy they are to make and how they taste like the season! These smoothies are good for your, they taste amazing (perfect for the season), and they're so easy to make for a morning drink, or as an afternoon snack! Adjust the honey to your taste. This recipe yields 2, 10-ounce smoothies. You can add other ingredients to the mix, too! I've added about 2 cups of packed fresh spinach to these smoothies for even more color, flavor, and good-for-you ingredients! This looks REALLY good and refreshing! I have bookmarked to try it out! I've never thought to put grapes on a smoothie. Sounds so refreshing! Hi Lindsay! Yes! And like I said, freeze them up and they turn into the perfect "ice cubes!" these look great! I love anything with apple! I'm adding these to my recipe book! Thanks, Kristen! They are super tasty! Thanks, Danielle! Oh, I hope you try them - I'm really loving them (and how easy they are to make)! I try to make a smoothie for breakfast for my family every morning and am always looking for new recipes to try! That's great, Tonia! Hope you give these a try and enjoy them! These sound so refreshing and great for fall! Thank you, Leah - yes - perfect for the season! Simple and delicious! This looks seriously awesome! Thanks for sharing. I love the little water droplets on the apple as well. This looks so refreshing! Love the cinnamon in it! This sounds so refreshing! Loving the idea cinnamon and grapes. Great smoothie flavors! Looks amazingly refreshing. I'm always looking for new smoothie recipes--my teenager loves them! This looks yum! Hi Wendy! Oh good! I hope you give these a try and enjoy! This looks so delicious! I love the combination of apples and cinnamon. Yum! I cannot wait to try this recipe when I visit my nephews over the holidays. I think even my picky-eating 3 year-old nephew will love this! Thanks. Hi Aarika! How fun - I hope you all enjoy a batch of these! Such a yummy combination, I would definitely enjoy this! Thanks, Kimberly! I hope you do! The smoothie looks delicious! And cranberry-apple pie spring rolls??? Yes please! Thanks, Allie! Those spring rolls are so fun for the holidays (and beyond)! 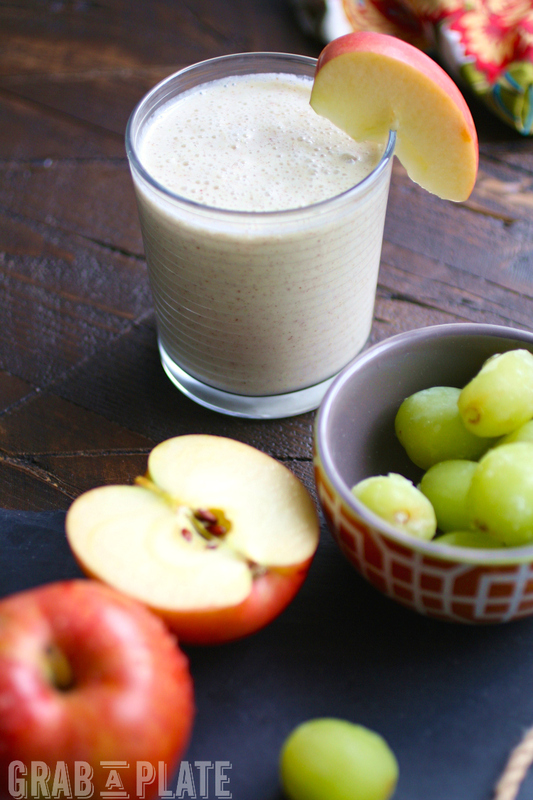 Love the addition of grapes in these smoothies, Patricia! The flavors in this smoothie are so unique. I can't wait to try it! Thanks, Lauren! Hope you get to try it soon! Thanks, Maryanne! Yes, frozen up, those grapes are awesome (great in the summer heat, too)! This is exactly my kind of smoothie! I love the apple and cinnamon in here! I've been trying to drink more smoothies lately to balance out all of the indulgences this time of year, and I'll have to try this one soon! I LOVE the frozen grapes idea for the smoothies! Brilliant! What a healthy way to start the day. My son is the smoothie guy in this house, and I wish I could follow his lead! I'm so bad, I would rather have a piece of cake for breakfast! :( Not that I do that often, I just would rather...oh dear. Haha!! Cake for breakfast sounds right up my alley! This is a good way to keep me from going crazy with the desserts,though! Hope you (and your son) try it and enjoy! I'm not usually a big fan of smoothies - but I must say this is inviting and looks so good... and healthy! This sounds (and looks) so delicious and refreshing Patricia. The perfect start to the day and also the ideal way to break up treats season :) I love the simplicity and wholesomeness of this smoothie. Perfect. Thanks, Kelly! Yes, I can go a little crazy with all the sweets - so tempting and I love them all! This is sweet, too, though -- bonus! Love the sound of this healthy smoothie! So many people enjoy milk products, but of course you don't have to stick to the recipe. Hope you can tailor this to suit your tastes!